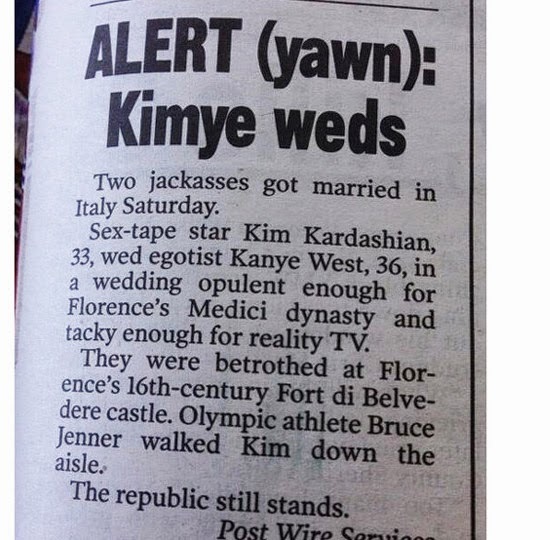 The NY Post prints hilariously cynical wedding announcement for Kim Kardashain and Kanye West's wedding. Many outlets covered the glamour, fashion pieces, and rumours surrounding the event. But the New York Post went with this instead. Two jackasses got married in Italy Saturday. I posted this on FB as a show of solidarity. Writer was reading my mind.